Children learn to use both sides of their bodies in stages. scissors while holding and controlling the paper with the other hand. 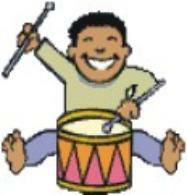 Percussion toys: symbols, drums (both hands together), etc. Crawl on all fours: forward, backward, sideways or change direction on command. is doing something else. Two handed, or footed, tasks are challenging and difficult to accomplish. scissors and being unaware of the other hand that has to control and move the paper simultaneously.